The climbers move up the network of linked spaces on the mountain. 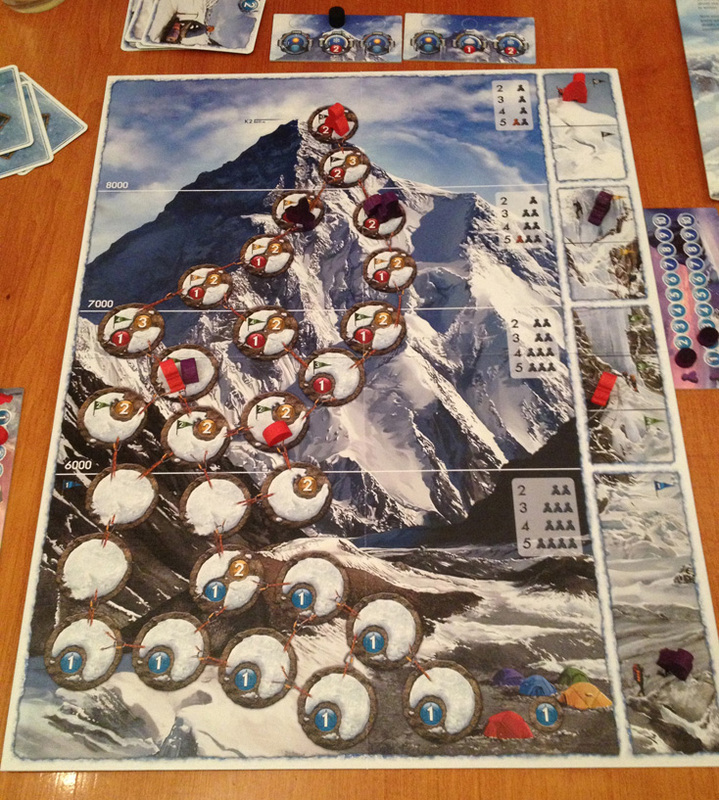 Moving to an adjacent space costs 1-3 movement points (depending on the space) and rope cards have a greater value when used for moving down the mountain. Each climber has a tent they can pitch in a space by paying movement points equal to the cost of moving to that space; however, once pitched a climber’s tent can never be moved. Spaces at different heights have maximum occupancy limits, although climbers can always pass through. This number varies based on the number of players so this adds some good scaling (no pun intended, but duly noted). Once all players have used their cards, players alter their climbers’ health levels. A climber in a space with one of their own colour tents gains 1 point as do climbers in the lowest altitude spaces. Climbers at higher altitudes reduce their health level according to the space plus, each turn, weather conditions can reduce health at certain altitudes. Players can see the weather 3 to 6 days (turns) in advance so can plan for it (although that foreknowledge still didn’t stop 2 climbers in our game dying). Any climber at zero health perishes. The game ends after the 18th day. Each climber scores points based on the highest space they reached (so long as they survived the game) and a player’s is the total of these. If any perish they only score 1 point. Tie-breaks between players who reached the summit are based on who reached the summit first, so this adds a race element to the game (although even without this rule, players are competitive creatures so it feels like a race anyway). Overall, K2 was really good fun. The core gameplay is picking the 3 cards you will use each round and this is usually entertainingly difficult because you always feel you need more than 3 cards to achieve what you want. Plus, you’re constantly fighting your own instinct to go as fast as possible which usually jeopardises your climbers’ safety. The maximum climbers per space adds an element of needing to deduce where your opponents are going as they could block you and ruin your plans, so turn order is important. When to use the tents is an interesting choice, as gaining 1 health can make all the difference, but it comes at the cost of movement points which already feel scarce and you never want to pitch your tent too early. With a few more plays, I would learn how to manage my cards better, as well as read the weather better too, but I don’t think I would ever feel safe – and this is a good thing as the tension of the game is one of its key rewarding elements. The game board has two sides – easy and hard – and has two sets of weather cards – summer and winter. This adds nice replayability as well as a difficulty setting. We played the easy board with summer weather – the hard board with winter weather must be seriously difficult (which means players need to seriously consider how high they will try to reach). The risk tokens are an interesting system. Players, of course, pick the token with the smallest penalty which means that the penalties are likely to get worse as the game progresses as the least harmful ones get used first. It’s a subtle but clever game mechanic which penalises the player trying to go furthest and it adds a slightly unknown element into each turn (as you’re not sure if you need to include the extra penalty into your plans which are always already very tight). The only element I wasn’t keen on was turn order which simply goes clockwise and start player moves on clockwise one position each round. This is simple but turn order is critical as going first in a round is a big advantage because moving first allows you to fill a space to block other climbers getting there, plus you know you don’t have to factor in other player’s movement. So, this leaves a bit of the game down to luck that the important moves for you will align with being early in the turn order. I would have preferred another mechanism such as going in order of who is trying to move the furthest (in the same way the risk token is allocated each round) and I think this works thematically too. However, this is a minor issue and probably less important when playing with more players. 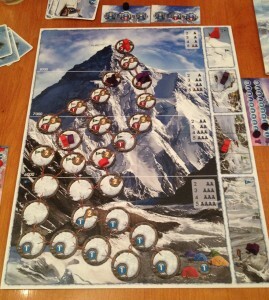 At the end of our game, we each had one climber left each and I was beaten to the summit. With no way to out-score my opponent (as he reached the summit first and we both had 1 climber left) , I decided the only honourable thing to do was to abandon my attempt on the summit and try to block him from coming down so he’d be killed by the exposure to the elements. Ah, the noble pursuit of victory – I’m not quite sure this was what the designer had inn mind. I wasn’t able to hinder the descent much, but if there had been just one bit of bad weather, my opponent would not have survived the extra exposure as he had no acclimatisation cards. Unfortunately for me, all the weather was perfect and he survived. 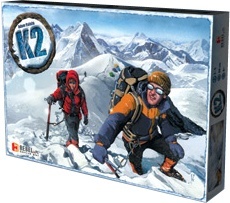 In the end, K2 proved to be a tense, fun game full of tricky decisions and it also worked well with 2 players. I think the designer has done a great job of creating great mechanics that deliver an entertaining game and that really bring out the theme too. If you’ve been reading my blog for a while, you’ll know I went on a trek in the Himalayas a couple of years ago when I walked to an altitude of 5,416 metres which is the same height as K2’s base camp. I will always cherish the photos of me with my meeple at the top, but now I wish I’d had the K2 climber meeples (and that we could have played K2 on the trip). This entry was posted on Friday, February 1st, 2013 at 8:26 pm	and is filed under Board Game Review, Board Games, K2. You can follow any responses to this entry through the RSS 2.0 feed. You can leave a response, or trackback from your own site. I noticed your absence. Good to have you back! 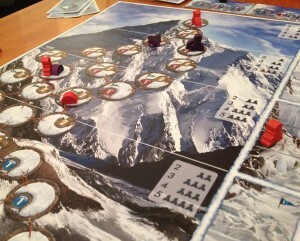 K2 is a great game, but what surprised me the most was that it’s always tense with any number of players. The maximum space for climbers on each spot is balanced for the number of players and is reduced the higher up the mountain you go. I’ve played with three, four and five and that tension is always there. I have yet to try the expansion, but it looks like fun. Thanks, Jacob. Good to hear it plays well with all numbers. I can imagine it’s quite challenging trying to cater for the movement of lots of other players in your plans.